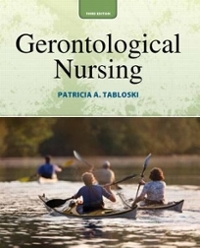 Gerontological Nursing 3 Edition GERONTOLOGICAL NURSING, 3/e is a comprehensive, research-based, and up-to-date guide to nursing care for older adults in all settings. It brings together essential information about normal and pathological changes associated with aging; healthy aging; common diseases of aging; and key psychosocial, cultural, and public health issues. Reflecting today's emphasis on evidence-based practice and appropriate delivery of scarce healthcare resources, this text presents new best practices and QSEN standards throughout, promoting more effective assessment, diagnosis, planning, and outcome evaluation. The text's multidisciplinary approaches help nurses “add life to years,” not just extend life. Its coverage of acute and chronic diseases includes nursing implications, atypical presentation, functional implications, pharmacology, evaluation, etiology, risk factors, and complications; the text also includes a full chapter on multisystem diseases. This book supports safe, effective, and appropriate practice in the home, hospitals, long-term care, and hospice settings.